If you grew up in the ’80s and ’90s, then you will no doubt know who Don Bluth is. He created several childhood classics like The Land Before Time and The Secret of Nimh. In addition to animated cartoons, he’s also well known for his popular arcade game Dragon’s Lair. This brought the world of animated cartoons to the arcade for the first time and graphically it looked light years beyond anything else on the market. So much so that no home console at the time could handle an exact port the game so developers had to recreate the game in a variety of different styles. After the game’s massive success in arcades, Mr. Bluth went on to work on a sequel and a sort of side game using the same technology. Gamers had to wait all the way until 2010 for the arcade version of Dragon’s Lair to properly be converted to home consoles. It was bundled in with the sequel and Space Ace and dubbed Dragon’s Lair Trilogy. It has now made its long journey to the Switch so now fans of the arcade game can play anywhere they like. Dragon’s Lair Trilogy consists of 3 arcade games: Dragon’s Lair, Dragon’s Lair 2: Time Warp, and Space Ace. While each game has its own unique story, they all feature similar gameplay mechanics. The games are essentially animated movies that you must interact with and press buttons at just the right time to proceed. There are four directional buttons and one action button. You will have to quickly press one of these buttons to help your character out of a situation. However, if you press a wrong button, or don’t press the right button fast enough, then you will lose a life (and you will many times). Lose all your lives and it’s game over. The objective of the game is to score as many points as you can by the time you finish. Points will add up with each correct input you press, and they will be deducted with each failed button press. If you get a game over, then your points will be reset. The game has a built-in leaderboard for you to keep testing yourself against. The games will require you to be fast and focused, especially if you’re aiming for the bigger scores. The games are difficult at first, but eventually you’ll begin to memorize the actions needed to succeed and with practice most players should be able to nail the timing pretty easily. There’s a lot of trial and error, and that’s by design. After all, this game was created to take as much money from customers as possible! In Dragon’s Lair you play as the heroic Dirk the Daring, who must explore the depths of a sinister castle and rescue the fair princess Daphne from a dragon. Dragons Lair 2: Time Warp take a bit of an odd direction. Princess Daphne is kidnapped once again, but this time by the evil wizard Mordroc. You follow the time-traveling wizard into the Time Warp, taking you to a variety of odd locales like Mozart’s piano, where you must rescue Daphne before she’s lost in time forever. By far the strangest of the three is Space Ace, going even further into left field than Time Warp did. You play as Ace, Defender of Justice, who was turned into a child by the villainous Commander Borf and his Infanto-Ray. Borf plans to take over the universe by turning everyone into children, and you must stop him before he can enact his evil plan. While the stories can get a bit weird, they are still so much fun to watch unfold. It doesn’t need to be said that the animation is astounding, especially for its time. There’s so much creativity put into the games and their stories are beautifully told through the visuals. You’ll be happy to know that everything runs perfectly smooth on the Switch, in both docked and handheld mode. While I can’t speak for the quality of the controls for the original arcade versions, the Nintendo Switch version at least plays well enough. I haven’t had any unresponsive button inputs, and the action never felt out of sync with the animation. The three games in the collection hardly have any musical scores, let alone during the gameplay. While the games don’t have a traditional musical score, they rely far more heavily on sound effects. You will constantly hear musical cues reacting to certain situations, as well as the natural ambient sound effects from the environments you are exploring. Since the musical cues do help you know what’s coming up and when you need to react to stuff, having a constant soundtrack would have most likely been too distracting. While the games don’t really offer any new content, besides some cut scenes from the original arcade releases, they do offer a ton of features to mess around with. You can sit back and watch the scenes from the games, view an interview of the development of Dragon’s Lair, watch a tutorial on how to play, and even see the attract mode used in the arcade machines to entice passersby to part with their money. There are also a variety of options you can select from when playing the games. Small aesthetic choices like playing the games with the arcade cabinet in view are nice touches. You can utilize arcade or home console rules and even select how many lives you get, and the difficulty setting. These options help make the game as challenging or easy as you like and should provide entertainment for veterans and new fans alike. 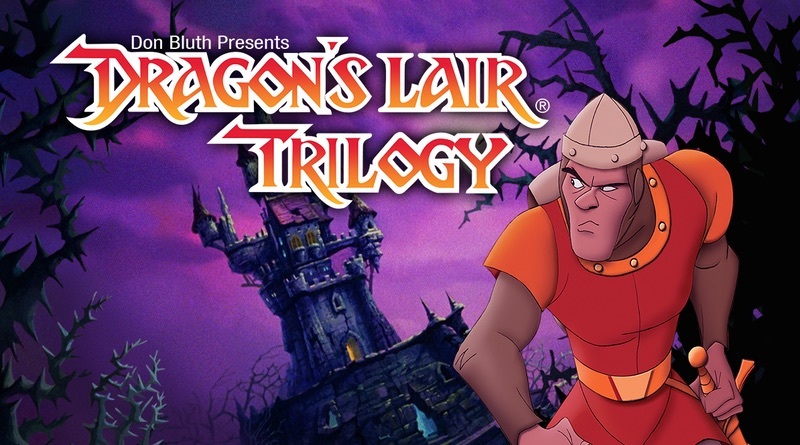 Dragon’s Lair Trilogy is a collection of beautifully animated arcade classics that stand the test of time. They were great back in the day, and they play great on the Nintendo Switch. Everything from the classic arcade games has been preserved in the trilogy collection, and it even has some extra features, customizable options, and deleted scenes not used in the arcade versions.